Happy Book Birthday to Carrie!!! 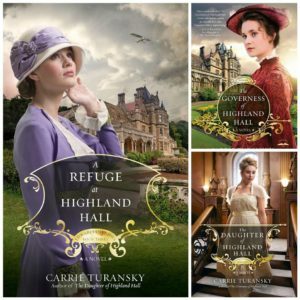 I have not read many of Carrie's books yet, but I love the settings she has chosen. Shine Like the Dawn takes place in 1903, at the beginning of the Edwardian Era we see so many new inventions and exciting contraptions, like motor vehicles! This story starts with tragedy and through the difficult lessons and circumstances that both Nathaniel and Maggie find themselves in, it was so good to see them act and react as normal human beings. And through it all, they learn and grow. Maggie is full of questions and is determined to seek justice, no matter the risk or cost. Nate is such a protector, of the ones he loves and the ones that he is responsible for. Filled with unanswered questions, Maggie dives into an investigation. With Nate's help will she be able to solve a tragic mystery that is now years since past? Will she learn how to trust God to give her the answers she NEEDS, even if they aren't the answers she WANTS? Be swept back in time to solve the crime and bring justice to Heatherton alongside Margaret Lounsbury. 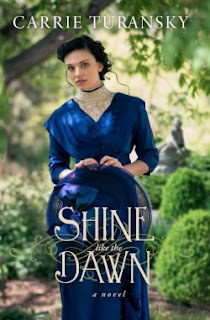 I received a complimentary uncorrected proof of Shine Like the Dawn from the publishers. I was not required to write a positive review. All opinions expressed are mine alone. 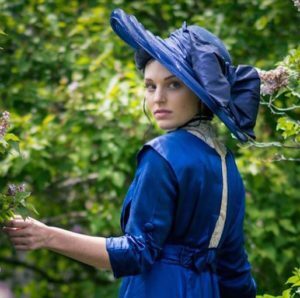 Hats in the Edwardian era were large and often covered with feathers, flowers, lace, netting, berries and bows. 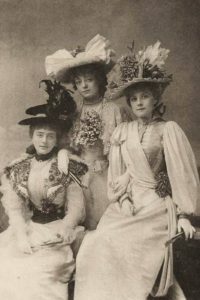 The “bird nests,” as Coco Chanel called them, were held on with large hat pins stuck through piles of hair on the crown. These hats were called Gainsborough or Picture hats because of the way they framed a lady’s face. They often featured huge dried flower arrangements and sometimes included real leaves and twigs! No doubt the Garden hat was a fitting name. 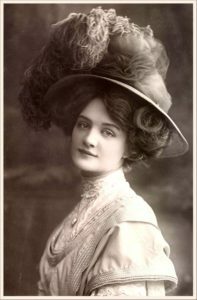 1907 The Merry Window hat became very popular after the leading lady in the play by that same name wore a hat that was even taller and wider than usual. Some people complained these hats were too big and obtrusive in public places like the theater or picture shows. But English women loved them and wore them to all kinds of events. The popularity of using large feathers and stuffed birds on hats caused concern for the welfare of birds. Many protective laws took effect and milliners had to use more ribbon and tulle and only large ostrich feathers to decorate hats. Those ostrich feathers came from birds that were raised on farms and their feathers were collected as they fell out naturally. 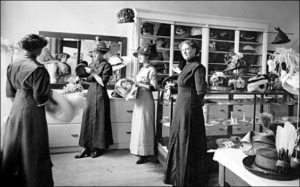 The movement toward smaller hats began around 1913 when hats still had high crowns but smaller brims. Straw boaters, small top hats, and mini versions of picture hats were very common. I am excited to be able to host a second giveaway! This one is for a print copy of Shine Like the Dawn. This is an UNCORRECTED PROOF. Giveaway copy courtesy of Multnomah Publishing. Hi Lisa, thanks for stopping by! This is my first Celebrate Lit blog tour, and I'm excited to connect with new reading friends! Thank you for stopping by Lisa! Yay! I love this story, too! Hi Beth Erin, thanks for your encouraging words! Glad you enjoyed Shine Like the Dawn! Yay! Excited to see your thoughts in a couple days! I love the way Carrie writes. So inviting! Yes, I agree Michelle! Thank you for stopping by! Thanks for this lovely post, Rachel! I loved meeting you at CFRR and following your blog and Facebook posts. I appreciate you helping me spread the word about Shine Like the Dawn. It is my honor Carrie! It is a very lovely post, love the old pics and your review !!! I can't wait to read this one, I have read the others in this series ! Thank you all for the giveaway ! Hi Linda, thank you for stopping by. I'm so happy to hear you enjoyed The Edwardian Brides Series. Those will always be special stories to me. I listened to them on audio recently. It was fun to hear someone reading them aloud. It's a whole new experience, even though I knew the stories well. Blessings and Happy Reading! Thank you Linda! Happy reading! Love Carrie' books. Great genre! I agree, love the Edwardian period! I am anxiously awaiting the arrival of my book today!!! I have read all of Carrie's books! My only issue is that they just can't be published quickly enough!!!!!!! Keep on keeping on for the Lord! God bless!!!! Oh, I know the feeling!!! Haha thank you my dear! Yes HATS!!!! Congrats on your new release. Love the cover and synopsis of the book. Can't wait to read. Happy reading! Thank you for stopping by! Thanks for the review, Rachel. Carrie, your new book looks and sounds fantastic. I'm looking forward to reading it. Congratulations and good luck on your tour! CoNgRaTuLaTiOnS, Carrie, on the release of your newest book, Shine Like the Dawn!!! Thank you for stopping by Alison! Rachel, thanks for the delightful book review and the extra giveaway. I am looking forward to reading this book and I have already added it to my TBR pile. Congrats on your new book release and the book tour Carrie! I can't wait to follow along on the tour! Congrats on your new release, Carrie, and I can't wait to see what mind of mystery/suspense that you put into Shine Like the Dawn! It is good!!! Happy reading! Wow, it's so encouraging to read all these wonderful comments! Thank you, Rachel and friends! I hope you enjoy reading Shine Like the Dawn. Rachel, will I see you at CFRR in August? Isn't it so much fun! And YES! I will be at CFRR again this year! SO SO SO excited! CARRIE, I'm so excited to read Shine Like The Dawn! These hat photos are incredible! I love Carrie's books. This sounds especially good. Excited to read it!! Would love to win , I always love to read Carrie's books.